I have always loved the sounds of this blessing (sometimes called the ‘Priestly Blessing’), whether in Hebrew or English. The verbal repetitions, rhymes and cadences have a musical, incantatory quality that drew me in from a young age, well before I ever seriously thought about the meaning of the words. Even the simple English translations, ‘bless you … keep you … shine on you … be gracious to you … give you peace’ give me a warm feeling. The sentiments are as reassuring as the familiar sounds and rhythms. God spoke this blessing to Moses, telling him to speak it to Aaron and his sons, who, in turn, were to speak it to the children of Israel. Why? What does this blessing contain that is so important that it should be passed down from God to prophet to priest to the people, and so on down the generations? At a basic level, rabbis down the centuries, most notably Rashi (11th century), have interpreted the first line as referring to material prosperity, and that God, having bestowed such a gift, should protect it from theft, and the recipient from over-attachment to the gift. With light as a frequent metaphor for Torah, the second line has been seen as the blessing of Torah knowledge, and the redemption that its study can bring. Given that a fallen face is understood as anger, Rashi read the third line as indicating God suppressing His anger, and forgiving us with special compassion and the gift of peace and wholeness. But there may be more layers of meaning. Patterns permeate the text. The lines build from 3 words, to 5 and then to 7. The sum of these numbers, 15, is the number of letters in the first line; the next two lines build to 20 and 25 letters. The sum of these three numbers is 60, which is the number of eivarim (‘limbs’ – bones and surrounding tissue) in the two hands that the priests lifted up to make the blessing. Adding the numerical values of the 60 letters gives a total of 6,718; adding these four digits produces 22, the number of letters in the aleph-bet, the raw material with which God speaks everything into being. God’s name, a frequent traditional component of Jewish incantations, is woven into every line with the Tetragrammaton (YHVH); and with each line beginning with the letter yud, we get yud yud yud, which spells one of the 72 mystical names of God. The middle three words of the whole blessing, in the middle line, are adonai panav eilecha ‘God’s face towards you’; each of these words is found respectively as the middle word of each line, which means that the phrase intersects itself horizontally and vertically through the blessing. So this blessing uses visual patterns, number patterns and codes, and repeated use of explicit and hidden God names to add to its magical potency. The measured increase in line length, coupled with the rhythms and rhymes, pulls us powerfully towards the strong final cadence on the word shalom. But what about the specific choice of words? I see a remarkable correspondence between this text and some core mystical teachings of kabbalah. Moses ben Cordovero (‘Ramak’, 1522–1570) taught that the purpose of those who engage in kabbalah is “to cause life to flow to all”. Shefa, the abundant flow of life and goodness from God, is a core concept in kabbalah, and we see this intentional flow in the verses introducing Y’varech’cha (vv.22-23) – God speaks the words to Moses, who speaks them to Aaron and his sons, who speaks them to the children of Israel. No person can bless another, but God’s blessing can be handed forward by people: “So shall they [the priests] put My name upon the children of Israel, and I will bless them.” (Num 6:27). And when God blesses Abraham (Gen 12:2) and his descendants, the formula ends “and you will be a blessing”; we are not meant to guard our blessings jealously, but to pass on to others the benefits of the blessings we receive. After all, the alternative in kabbalah to shefa is Or, the ‘light’ of God, and as recipients of this, the Israelites are called to be a ‘light to the nations’ (Isaiah 42:6). How do we receive this ‘light’? It is said to be poured into Creation, represented by the ten sefirot, ‘spheres’ (s. sefirah) on the ‘Tree of Life’ (see diagram), so that everything is animated and sustained by it. I believe that this process is encoded metaphorically in Y’varech’cha, which is an incantation designed to transmit this ‘light’. To demonstrate this, I will map the blessing using the 10 sefirot. It is worth remembering in this extremely abbreviated exercise that, if a sefirah is expressed in the blessing, all its related attributes can be assumed to be included. And if all 10 sefirot are present, this blessing represents a blueprint, or even a ‘download’ of the totality of God’s qualities and beneficence. Keter (‘crown’), the first of the sefirot, is sometimes called the Or Ein Sof (‘the Light of the Eternal’), and can be understood as the place closest to the Divine Source of ‘light’ – blessing and goodness – that is poured out by God as a gift. The root letters of y’varech’cha (bless) are beit-reish-kaf, the same as in bareich, meaning a fountain. The ‘light’ emanates from the ‘fountain’. … and binah (‘understanding’, masculine aspect). Such is the potency of the outpouring of lovingkindness, that it must be channeled and contained; hence v’yishm’recha (keep) which is gevurah (‘restraint’) on the Tree. Yaeir (‘shine’) shares the word root with ‘light’ (or), and Or Ein Sof (‘the Light of the Eternal’) which links this moment in the blessing back to keter. Keter is also referred to as arich anpin (from erech apaim in the 13 Attributes); literally meaning ‘long nose’ (or ‘face’), it implies a ‘long breath’ of patience and kindness, from which we derive the God-name ‘the Infinitely Patient One’. This ‘concealed’ face of God is expressed in our blessing with the words adonai panav eilecha in line 2. The infinite love, the fountain-like outpouring of blessing and goodness that God offers with this ‘light’ is found in the sefirot as chesed, abundant lovingkindness. The shining gaze of God, however loving, could destroy us with us its intensity and ability to see everything in us, so this is tempered by vichuneka, which comes from chanan (‘favour’), which is related to mercy (rachamim) and kabbalistically to tiferet (‘harmony’) on the Tree. Yisa, the ‘lifting up’ of God’s face, shows us God’s willingness to be vulnerable, which is hod. The reappearance of adonai panav eilecha in line 3 gives us the zeir anpin, ‘small face’ of God; this is the six sefirot from chesed to yesod, and is the ‘revealed’ face of God in Creation. The two appearances of adonai panav eilecha represent the two kabbalistic ‘faces’ of God: the ‘concealed light’ of arich anpin is revealed when it flows into zeir anpin. V’yaseim l’cha – ‘put on you’ – is the assertive, dominant aspect of God, which is netzach (balancing hod, its opposite). The Rabbis taught that ‘the name of God is peace (shalom)’ (Shabbat 10b, based on Gideon in Judges 6:24); so the blessing encodes yet another name of God. The Zohar also says that shalom is equated with yesod (‘union’). The last sentence in the Talmud (Uktzin 3:12) states: “The Holy One, Blessed be He, found no vessel that could contain blessing for Israel save that of peace (shalom), as it is written: ‘The Lord will give strength to His people; the Lord will bless His people with peace (Ps 29:11).’” Shalom becomes the container for all that has come before in this blessing. 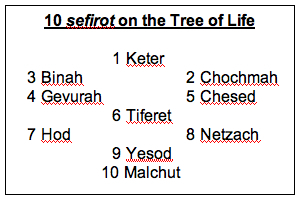 So if the concealed and revealed ‘faces’ of God, and these nine sefirot can be found in Y’varech’cha, and we have come to the end of the blessing, what has happened to malchut (‘kingdom’), the tenth sefirah? In v.27, after the blessing, we read: ““So shall they [the priests] put My name upon the children of Israel, and I will bless them.” We learned earlier that this whole passage is about the flow of God’s ‘light’ and abundance – metaphorically, Gods ‘name’ – down through the Tree of Life, and yesod channels this to the final point on the Tree: malchut, the recipient of the ‘light’, which, in this case, is Israel, as identified in v.27. My speculation about 1-3 being present in the threefold blessing may be too tenuous, and it may be that the threefold blessing refers only to sefirot 4-10. Another possibility is that, just as sefirah 1o/malchut/Israel is included in v.27 , i.e. after the threefold blessing, the first 3 sefirot may be implied by the inclusion of God in v.22, preceding the threefold blessing. and bring you to wholeness and bring you to peace. Receiving shalom is not the end of the process. How can we be at peace if others are not? How can we be whole, when the world is still broken? There can be no shalom for anyone until there is shalom for everyone. Remember that this blessing is all about shefa ‘flow’ and its equivalent: or ‘light’. What should we do with this light/flow that comes to us? We are taught that we are to be or goyim, a ‘light to the nations’ (Isaiah 42:6). Abraham was told by God: “And I will bless you (va’avarech’cha); I will make your name great, and you shall be a blessing (v’hayeh v’rachah).” (Gen 12:2) What does it mean to be a blessing? What does that look like? The God-name of YHVH is used three times in the text, and each of the three lines begins with a yud (three yud’s spelling a mystical name of God). To parallel this in the piece, in bb 17-18 and 25-26, the interplay of voice parts creates three statements of Adonai each time. The tri-partite statement is more subtle in bb 9-12; the first Adonai begins in the alto part, is followed by the second in the tenor and bass parts, and then heard in the soprano main tune. In the English section of this tune, the first line of words is set to 15 notes, the second to 20 notes, and the third to 25 notes, matching the patterning of the original Hebrew letters. One of the important messages of this blessing is: ‘God’s face towards you’ – adonai panav eilecha. In this music, the choral voices sing words simultaneously (ie in homophonic ‘vertical’ alignment) only when these particular words occur, both in the Hebrew (bb17-20, 25-28) and English (bb42-43) sections, paralleling the idea of the simultaneous horizontal and vertical arrangement of words. My English lyric-translation is written for both musicality and to match the Hebrew structure of line starts sounding similar, and phrases rhyming. I prefer to avoid gendering God when possible. And I have expanded shalom to give a deeper understanding of its word root (shoresh) connection to wholeness; and, rather than ‘bring you peace’, ‘bring you to peace’ expresses, I hope, the idea of a process, and the transformation that comes from being blessed. b25ff and b49ff give two different musical ways of conveying both the physical and emotional moment of God’s face ‘lifting’ towards us.